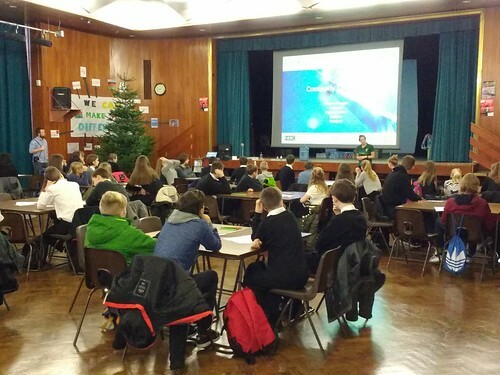 The Balwearie High School, in Kirkcaldy Scotland, empowered its pupils to create a prototype wind turbine after it was awarded Erasmus+ funding to run a two year Strategic Partnership project looking at ‘Innovative and Entrepreneurial Solutions to Climate Change’. This project, highly relevant to current concerns over climate change and sustainability, involved students in Scotland, Finland and Germany creating novel approaches and entrepreneurial ways to tackle these issues, conducting surveys, completing scientific research projects and studying national and EU policies promoting sustainable and renewable energy solutions. Students, ranging from 12 to 15 years old, had to apply to take part in the project, but were then rewarded with an exciting programme of activities. They researched lichens and water quality to indicate levels of pollution, looked at the use of tea bag and worm surveys to introduce citizen science and climate change monitoring techniques and also helped to improve local environmental conditions through tree planting, creating bird houses and cleaning the local area. They were also able to take part in lessons and activities in their partner countries, attending a lecture from the Finnish Nature League about environmental friendly policies, visiting Heureka, the Finnish Science Center in Vantaa, and taking part in a workshop at VW in Wolfsburg to build a car run by solar energy. Back home in Scotland, pupils visited the Cruachan Hydroelectric Plant and listened to a presentation by a member of the Climate Change Focus Group for the Scottish Parliament. They also took part in activities ran by Geobus, an outreach group from St Andrew’s University that saw the pupils ‘running’ a wind turbine business where they had to design, fund and build a wind turbine prototype, then advertise it, market their business and create a presentation on their design. In a scenario fit for ‘The Apprentice’ or ‘Dragon’s Den’, each school had to present their business plans, products and prototypes and receive feedback from a panel of experts (representatives of VW, the Technical University of Braunschweig and the University of Applied Sciences, Wolfenbuettel) who deliberated on the practicability of the ideas and possible economic outcomes. They must have impressed the panel as Henriette-Breymann-Gesamtschule will continue to work alongside the University of Applied Sciences to try and build the wind turbine! The schools took a student-focused approach to the project work, enabling pupils to lead their own learning, discovering how to evaluate peer work and team work results, take on board feedback and further develop their ideas and projects. The students attended and held weekly meetings to develop their communication, presentation, scientific and language skills and gained experience in different job sectors, such as the car industry and renewable energies. They did an extensive amount of market and scientific research and, in order to plan projects and exchange ideas, they had to become very proficient with IT and social media. By designing prototypes and using 3 D modelling, students also improved their entrepreneurial skills. Pupils have been able to acquire these key 21st century skills, as well as gaining cultural awareness, team building and language skills, all the while learning about this important global topic of climate change. All participating teachers took part in regular, cross-subject lessons and observed the different teaching methodologies in each other’s countries. The observed teaching methodologies in Germany and Finland were disseminated informally throughout Balwearie High School and they are in the process of organising more formal Continuous Professional Development sessions. The resources provided by OPAL have been integrated into the science curriculum at Balwearie High School and will continue to be used in their environmental studies lessons. As well as increasing pupils and staff’s knowledge on the effects of pollution and global warming on the environment, the project has resulted in pupils developing skills to support them in their education and career paths. All the participating pupils have also won the John Muir award through achieving the four challenges; discover a wild place, explore it, conserve it and share their experiences. Staff have also benefitted, developing innovative approaches to teaching and learning and sharing pedagogy across different educational regions within Europe. Although activities and different parts of the project were closely connected to the curriculum of each country and school, we used an innovative approach that was something different from every-day school work and will be something for pupils and staff to remember for years to come. - Andrew Ross, Chemistry Teacher and project coordinator. The schools plan to repeat many of the activities on an annual basis, even though the Erasmus+ project has now ended. Talk about sustainability! Find out what's new for schools funding in the 2018 Call in our blog post.